The purpose of this study was to examine the effects of recorded, preferred music in decreasing occurrences of aggressive behavior among individuals with Alzheimer's type dementia during bathing episodes. Eighteen older adults, age 55 to 95, with severe levels of cognitive impairment, participated in the study. They were randomly scheduled for observation during bath time under either a control (no music) condition or an experimental condition in which recorded selections of preferred music were played via audiotape recorder during the bathing episode. Following a 2-week (10 episode) observation period, conditions were reversed. A total of 20 observations were recorded for each individual. Results indicated that during the music condition, decreases occurred in 12 of 15 identified aggressive behaviors. Decreases were significant (p < 0.05) for the total number of observed behaviors and for hitting behaviors. During the music condition, caregivers frequently reported improved affect and a general increase in cooperation with the bathing task. The implications of these findings for improving the overall quality of care for severely cognitively impaired older adults are discussed. Incidents of aggressive behaviors among individuals residing in nursing homes cause problems for both staff and residents and contribute to diminished quality of life in nursing homes. Efforts to decrease such incidents begin with an understanding of what characterizes individuals who manifest these behaviors. In a study of 408 residents of one nursing facility, Marx, CohenMansfield, and Werner (1990) identified three distinct types of aggressive behavior. These include physically aggressive behaviors such as kicking, hitting, and scratching; verbally aggressive behaviors such as cursing; and sexually aggressive behaviors such as verbal or physical sexual advances. Their analyses found that aggressive behaviors were significantly related to several factors including male gender, cognitive impairment, a tendency to fall, poor quality of social interactions, and prior history of aggressive behaviors. The relationship between incidents of aggressive behavior and severe cognitive impairment also has been reported in studies by CohenMansfield, Marx, and Rosenthal (1990); Malone, Thompson, and Goodwin (1993); Rudman, Alverno, and Mattson (1993); and Ryden, Bossenmaier, and McLachlan (1991). Other documented factors associated with aggressive behaviors include longer stays in nursing homes, impaired activités of daily living (ADLs) functioning (Winger, Schirm, & Stewart, 1987), and adverse side effects associated with psychotropic medications (Malone et al., 1993). Ryden et al. (1991) noted among 124 residents on units for the cognitively impaired, aggressive behaviors were most frequently associated with the day shift, with invasions of residents' personal space, and with the use of physical restraints. Prevalence rates of aggressive behaviors among institutionalized older adults vary widely, with some studies reporting rates as low as 8% and others as high as 91% (CohenMansfield, Werner, Culpepper, Wolfson, & Bickel, 1996). Reasons for these discrepancies include use of various and differing operational definitions of "aggressive behavior" and diverse methods for collection of data. For example, Marx and colleagues (1990) reported a 49% prevalence rate for their sample of 408 residents. A rating scale was used to collect data in this study, and "aggressive behavior" was defined using the criteria listed above. Behavior rating scales were used by Winger et al. (1987) and by Ryden et al. (1991), with aggressive behaviors being operationalized according to the scales used. Instances of physical aggression contained in incident reports were examined by Malone et al. (1993). Rudman et al. (1993) used a standardized rating form developed by the Veterans Affairs system. * Behavior of another resident. * Violations of personal space. * Difficulties in ADLs and bathing. In a survey of nursing staff conducted by Bright (1986), the number one reported stress was physical aggression directed at other residents, followed by physical aggression directed at staff. In another survey of nursing staff conducted by Fisher, Fink, and Loomis (1993), staff working with dementia patients cited physical and verbal aggression among the most challenging behaviors requiring management. The authors attributed part of this management difficulty to the unpredictability with which these behaviors often occur and the fact that staff may not be sufficiently trained to deal with them. Respondents in a similar survey (Whall, Gillis, Yankou, Booth, and Beel-Bates, 1992) cited hitting or slapping, verbal aggression, and screaming as the three most disruptive behaviors in the nursing home setting. The most prevalent intervention used to decrease aggressive behavior among nursing home residents is medication (Cohen-Mansfield et al., 1996). Given the frequency of deleterious side effects of many of the medications and the fact that under the Omnibus Budget Reconciliation Act (Health Care Financing Administration, 1988), regulations regarding the use of both chemical and physical restraints have been strengthened, the need for alternate management strategies is apparent. In a review of the literature, Weinrich, Egbert, Eleazer, and Haddock (1995) reported that few empirically-based studies exist that document the effects of behavioral intervention strategies designed to decrease agitated behaviors in elderly nursing home residents. CohenMansfield et al. (1996) noted that studies of behavioral intervention strategies found in the literature typically use long-term residents of psychiatric facilities and employ intervention strategies which have remained untested among individuals with dementia. Music has been suggested as one possible intervention strategy for nursing home residents who display disruptive behaviors (Bright, 1986; Ryden & Feldt, 1992; Weinrich et al., 1995). The few studies that exist on the effects of music intervention focus on decreasing agitated behaviors. Recognizing that characteristics of the environment may contribute to the display of agitated behaviors, two studies focused on the use of music to modify the environment (Clair & Bernstein, 1994; Goddaer & Abraham, 1994). Clair and Bernstein (1994) introduced three conditions: no music, stimulating music, and sedative music into a day room in the hospital unit of a Veterans Affairs facility and measured the frequency of agitated behaviors displayed by 28 male patients with dementia under each condition. Data analysis indicated there were no differences in the number of agitated behaviors recorded during each condition. Goddaer and Abraham (1994) introduced relaxing music during the noon meal for nursing home residents with severe cognitive deficits. Overall, levels of agitation decreased by 63.4% during the weeks during which music was played. This decrease was significant for physically nonaggressive behaviors (56.3% reduction) and for verbally agitated behaviors (74.5% reduction). Gerdner and Swanson (1993) presented preferred, recorded music for 30-minute periods in five individual sessions each to five cognitively impaired, agitated nursing home residents. Because the subject sample was too small for statistical analysis, graphic analysis was presented to document patterns of agitated behaviors before, during, and after the music intervention. Casby and Holm (1994) observed the effects of recorded, relaxing classical music and favorite music on repetitive disruptive vocalizations (RDVs) in individuals with Alzheimer's dementia. In both studies, the music conditions appeared to decrease targeted agitated behaviors. However, conclusions about the effects of music intervention in these two studies seem quite tentative because of the small numbers of subjects and the idiosyncratic response patterns of the participants. Brotons and Pickett-Cooper (1996) engaged 20 subjects in 30-minute music therapy sessions twice weekly, for a total of five sessions. These sessions involved the subjects in a variety of music tasks including singing, dance/ movement, musical games, and simple improvisation exercises. Data analysis revealed subjects were significantly less agitated following music therapy sessions. Studies specifically addressing music-based strategies for the management of aggressive behaviors are rare. Meddaugh (1986) conducted a music-based exercise group with nine nursing home residents labeled "abusive" by nursing staff. The focus of the article is the description of the exercise-to-music procedure, and specifics regarding how the music was actually used in the exercise program are not offered. The author deemed the intervention successful based on the positive affect displayed by subjects during the sessions and by their ability to follow the directions of the exercise routines. 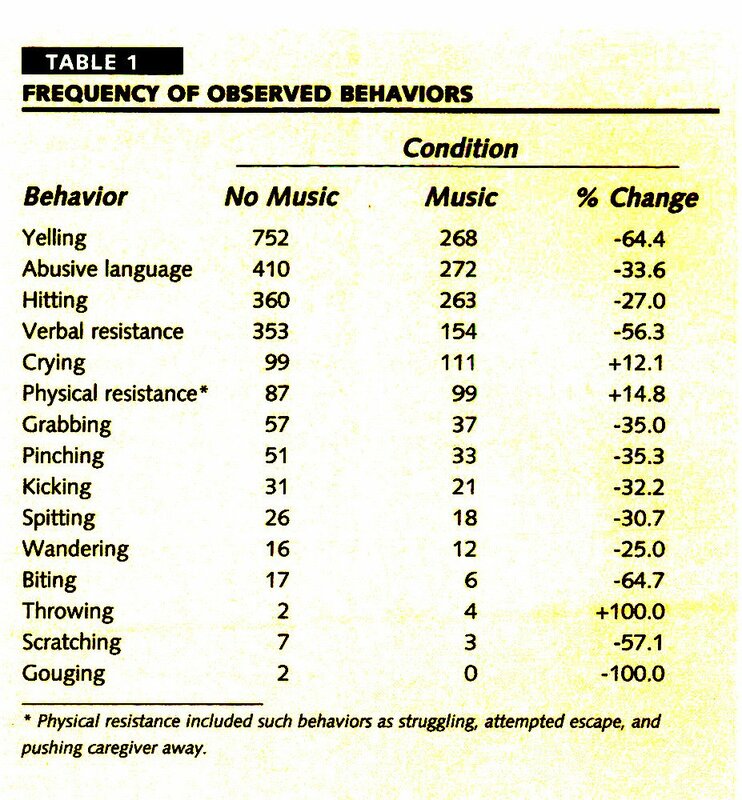 The minimal number of physically aggressive behaviors observed by Goddear and Abraham (1994) showed no significant change between music and nonmusic conditions. Given the paucity of literature on this topic, the purpose of this study was to examine the effects of recorded, preferred music in decreasing occurrences of aggressive behaviors among individuals with Alzheimer's type dementia during caregiving episodes. For the purpose of this study, "aggressive behaviors" were defined as any physical or verbal behaviors which could reasonably be interpreted as being hostile or harmful to other individuals. Eighteen individuals were recruited from a proprietary nursing facility in a rural location in the southern United States. Fourteen women and four men participated in the study. Ages ranged from 55 to 95 years (mean = 82; SD = 10; median = 84). Criteria for inclusion in the study included diagnosis of dementia and history of aggressive behaviors exhibited during caregiving routines. Criteria for exclusion included uncorrected hearing impairment and absence of a family member or responsible agent who could provide knowledge regarding the client's music background and preferences. The director of social services or her assistant identified prospective participants and contacted their responsible agents for permission to be included in the study. If willingness to participate was indicated, a meeting was scheduled between the responsible agents, a social services representative, and a member of the investigating team. During this meeting, the purpose of the study was explained and informed consent obtained. 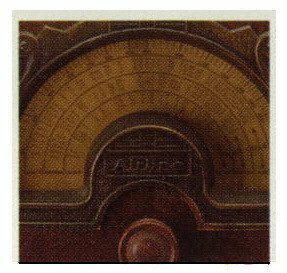 During the music condition, participants' preferred music was played on a Magnavox CD radiocassette recorder. 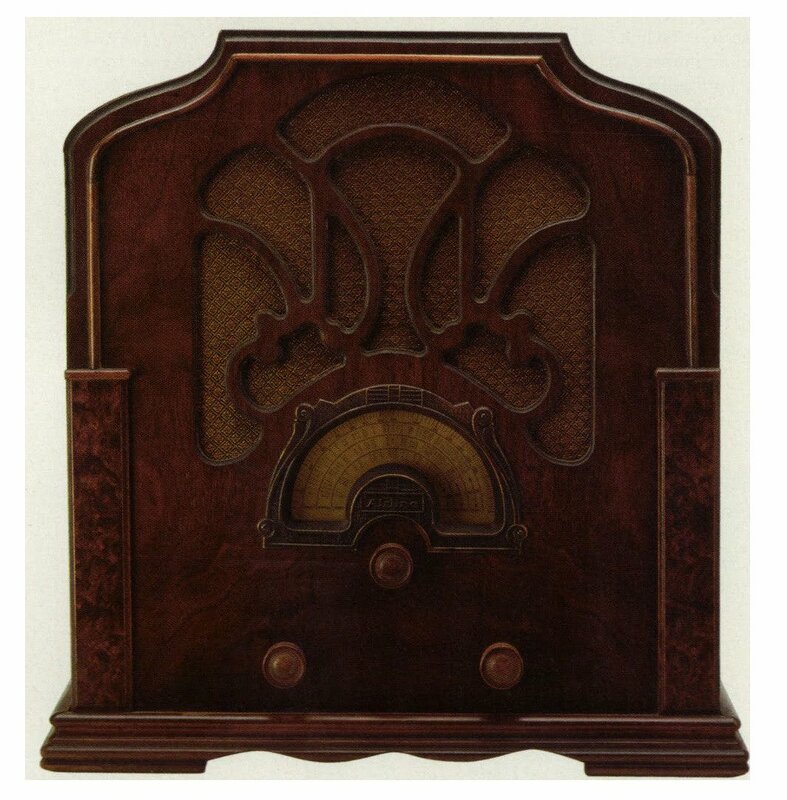 The most frequently preferred music was hymns, followed by old-time string music, big band, and classical music. Background information on participants was obtained in several ways. Charts were reviewed for information on ages, diagnoses, and psychotropic medications administered. Background information on participants' music experiences and preferences was obtained by interviews with the responsible agents. To determine cognitive status, the Mini-Mental State Examination (MMSE) (Folstein, Folstein, & McHugh, 1975) was administered to each participant by a trained research assistant. The MMSE is widely used in screening for dementia and has well-established psychometric properties. Discussions with nursing staff revealed that, in general, aggressive behaviors seemed most problematic during bathing episodes. Therefore, it was determined to restrict observations and music intervention to these times. After being enrolled in the study, participants were randomly scheduled for observation during bath time under either a control (no music) condition or an experimental condition in which recorded selections of preferred music were played via audiotape recorder during the bathing episode. Following a 2-week (10 episode) observation period, conditions were reversed. A total of 20 bathing episodes (10 control, 10 experimental) were observed on each participant over a period of approximately 4 weeks. Following established nursing routines, bathing times were scheduled for either morning or afternoon. Participants received either a partial bath, which was given in the participant's room, or a full bath, which was given in the shower on the nursing unit. Figure. Patterns of observed behaviors during different music conditions over time. Each bathing episode was observed by a trained research assistant. A total of four research assistants were used for the duration of the study. Inter-observer agreement was documented at the beginning and at approximately 2-week intervals during data collection and was consistently above .90. Target behaviors were listed on a checksheet, and the observer placed tally marks beside each behavior observed, noting both the occurrence of the behavior and its frequency. These behaviors included hitting, biting, yelling or screaming, crying, abusive language, wandering away, spitting, verbal and physical refusals to cooperate, pinching, scratching, gouging, kicking, throwing of objects, and grabbing. Physical refusal to cooperate was defined as struggling, attempted escape, and/or pushing caregiver away. Occurrences of crying and wandering away, while not conforming strictly to the definition of aggressive behaviors developed for the study, were included because staff identified these behaviors as contributing to difficulty during bathing episodes. One incident was determined to have occurred when there was a discrete, observable pause in the target behavior. The MMSE scores of study participants ranged from 1 to 22 points (mean = 10, SD = 73, ? = 15). Three participants were untestable. Only three scores were above 15 points, indicating that the majority of the study participants had severe levels of cognitive impairment. Prior to data analysis, the frequency patterns of observed behaviors were examined. 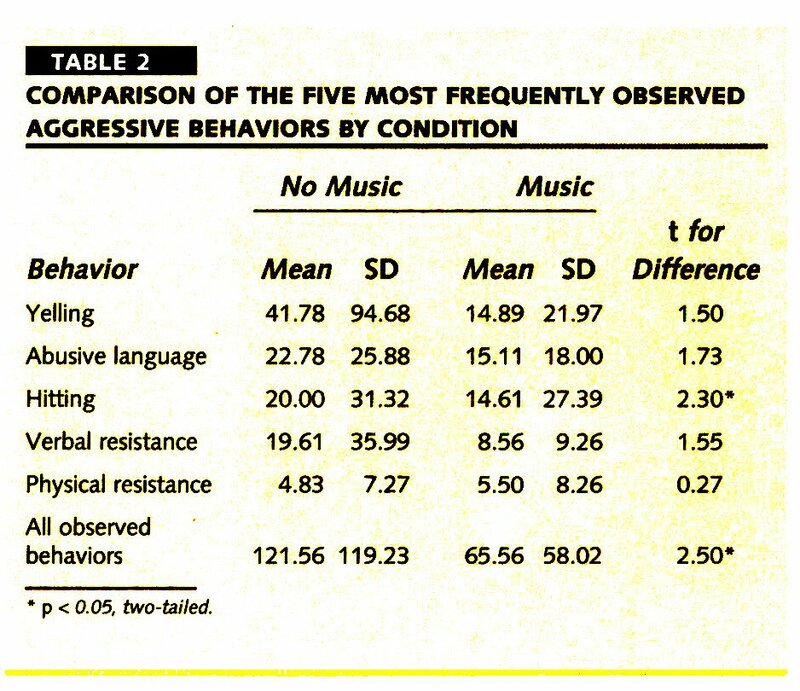 Total frequency of each behavior by condition is reported in Table 1, which shows that with the exception of crying, physical resistance, and throwing, fewer aggressive behaviors were observed during the music condition than during the control condition. While some occurrences of crying and wandering behaviors did occur, it was decided to eliminate them from data analysis because they did not fit the criteria for aggressive behavior established for the study. Of the 13 remaining behaviors, those with the highest frequency of occurrence were abusive language, yelling, hitting, and verbal and physical resistance to receiving care. The twotailed f-test for dependent measures was used to examine possible differences in the frequencies of these behaviors between music and no music conditions. The results of this analysis are reported in Table 2. A significant difference was found between total numbers of aggressive behaviors in the music and no music conditions. However, when each of the top five behaviors was examined separately, a significant difference was found only for hitting behavior. Additionally, a two-tailed t-test for dependent measures was performed using length of bathing session (measured in minutes) as a variable. The results of this analysis are presented in Table 3 and indicate that mean length of bathing episode did not differ significantly between music and no music conditions. The Figure illustrates patterns of observed behaviors over time. By random selection, 6 subjects participated first in the music condition, and 12 subjects participated first in the control (no music) condition. Subjects were switched to the alternate condition on the eleventh day of observation. In general, fewer occurrences of aggressive behaviors were observed during the music condition in both groups of subjects. This was especially evident among subjects assigned first to the control condition, where there was less volatility in aggressive behaviors when music was introduced. The results of this study suggest that preferred, recorded music may be beneficial in reducing the total number of aggressive behaviors displayed by cognitively impaired older adults during bathing episodes. Results of this study may be limited by several factors. First, the small sample size may have contributed to the lack of significance between conditions in many of the targeted behaviors. Another contributing factor may have been the extreme intrasubject and intersubject variability characteristic of this population. For example, one subject was responsible for 408 and 84 occurrences of yelling behavior in the no music and music conditions, respectively. Two subjects had no yelling behaviors. 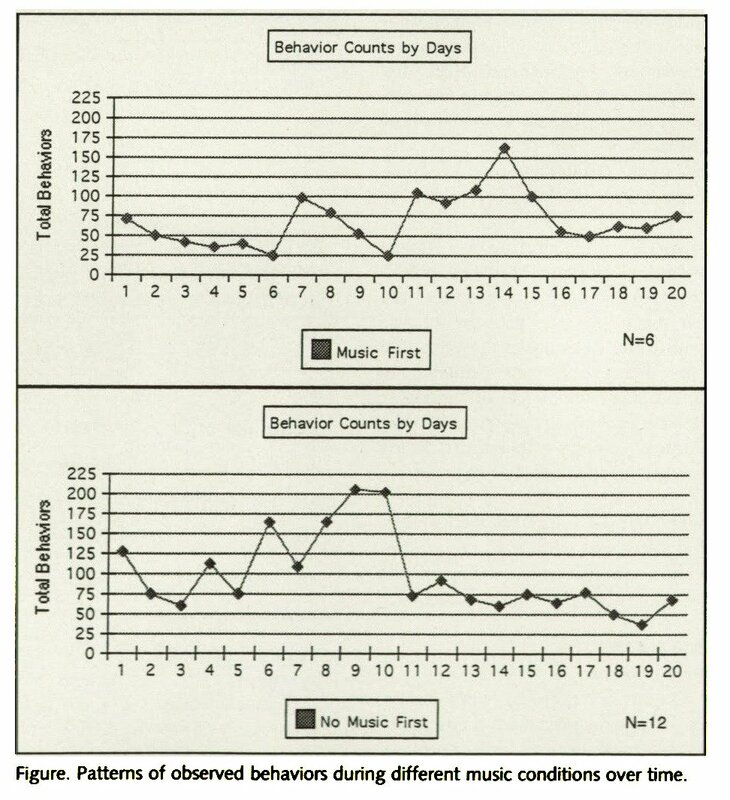 In Figure 1, two subjects accounted for 80 and 67 occurrences (90%) of observed behaviors on day 14 in the music-first condition. In the no music-first condition, one subject exhibited 76 occurrences (46%) of behaviors on day 6. When subjects with data points greater than three standard deviations from the mean were eliminated from analysis, little change in the overall pattern of results was noted. In their observational study of the frequency of agitated behaviors among cognitively impaired nursing home residents, Cohen-Mansfield, Werner, and Marx (1989) noted that large individual differences in patterns of agitated behavior tend to be characteristic of this population, and this presents certain obstacles for data analysis. In the present study, the five most frequently occurring behaviors, except physical resistance, showed a decrease in variability during the music condition. This is similar to the findings of Goddaer and Abraham (1994). 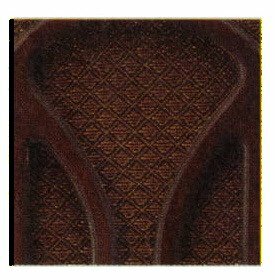 Consistent with their interpretation, this may be indicative of less intensity of aggressiveness among these subjects in the music condition. Although 13 aggressive behaviors were observed in the study, only 5 occurred with a high level of frequency. Future research might target these behaviors for closer examination and may be able to identify environmental or contextual circumstances which may be exacerbating them. Fourteen of the participants in the present study were on some type of psychotropic medication. However, the role played by medications in changing aggressive behavior patterns during the study period, and possible interactions of that with the music condition, were not examined. Possible effects of music in decreasing the need for such medication need to be examined in future studies. Given the fact that a bathing episode is a highly personal experience, great care was taken in developing a design for data collection which would optimize reliability of the data while respecting participants' rights to privacy. Initially, consideration was given to having nursing staff be responsible for turning on the audiotape recorder during the music conditions and for completing the data sheets following each bathing episode. However, during pilot testing of the procedures, this proved too cumbersome for already overburdened nursing staff. While the introduction of an observer likely altered the bathing episodes in some way, it seemed the most efficient way to ensure the data collection process was accurate. Observers were instructed to be as discrete as possible and not to interfere in any way with the actual bathing episode. Caregivers commented that during the music condition, they noticed improvements in mood and more smiling, dancing, and clapping in time to the music. Some subjects seemed calmer, and a general increase in cooperation with the bathing task also was reported. Such comments were reported for 10 of the 18 subjects. Whether or not the music or the improved affect exhibited by some subjects affected caregivers' perceptions of the tasks is not known. It is important that future research examine this aspect of the caregiving dynamic because staff's possible anticipation of a difficult bathing session with a seriously impaired older adult is in itself likely to contribute to such difficulty. In other words, presence of music might, directly and indirectly, make bath time more pleasant for staff, contributing to less stress and higher job satisfaction. Given the potential of music to make bath time more pleasant for cognitively impaired older adults, more extensive studies of the subject are needed. In addition to examining possible effects of music on caregivers' levels of stress, comparisons between subjects' preferred music and contemporary relaxation-type music also could be made. Bright, R. (1986). The use of music therapy and activities with demented patients are deemed "difficult to manage." Clinical Gerontologist, 6(2), 129-144. Brotons, M., & Pickett-Cooper, P.K. (1996). The effects of music therapy intervention on agitation behaviors of Alzheimer's disease patients. Journal of Music Therapy, 33,(1), 2-18. Casby, J.A., & Holm, M.B. (1994). The effect of music on repetitive disruptive vocalizations of persons with dementia. The American Journal of Occupational Therapy, 48\0), 883-889. Clair, A.A., & Bernstein, B. (1994). The effect of no music, stimulative background music and sedative background music on agitated behaviors in persons with severe dementia. Activities, Adaptation and Aging, /9(1), 61-70. Cohen-Mansfield, J., Marx, M.S., & Rosenthal, A.S. (1990). Dementia and agitation in nursing home residents: How are they related? Psychology and Aging, 5,(1), 3-8. Cohen- Mansfield, J., Werner, P., Culpepper, W.J., Wolfson, M.A., & Bickel, E. (1996). Wandering and aggression. In L. Carstensen, B. Edelstein, & L. Dornbrand (Eds. ), The practical handbook of clinical gerontology (pp. 374-397). Thousand Oaks, CA: Sage. Cohen-Mansfield, J., Werner, P., & Marx, M.S. (1989). An observational study of agitation in agitated nursing home residents. international Psychogeriatrics, 1(2), 153165. Cohen-Mansfield, J., Werner, P., & Marx, M.S. (1990). Screaming in nursing home residents. Journal of the American Geriatrics Society, 38, 785-792. Fisher, J.E., Fink, CM., & Loomis, CC. (1993). Frequency and management difficulty of behavioral problems among dementia patients in long-term care facilities. Clinical Gerontologist, 13(1), 3-12. Folstein, M.F., Folstein, S.E., & McHugh, P.R. (1975). Mini-mental state: A practical method for grading the cognitive state of patients for the clinician. Journal of Psychiatric Research, 12, 189-198. Gerdner, L. ?., & Swanson, E. A. (1993). Effects of individualized music on confused and agitated elderly patients. Archives of Psychiatric Nursing, 7(5), 284-291. Goddaer, J., & Abraham, LL. (1994). Effects of relaxing music on agitation during meals among nursing home residents with severe cognitive impairment. Archives of Psychiatric Nursing, S(3), 150-158. Health Care Financing Administration. (1988). Medicare/ 'Medicaid nursing home information: 1987-1988. Washington, DC: U.S. Government Printing Office. Malone, M. L., Thompson, L., & Goodwin, J.S. (1993). Aggressive behaviors among institutionalized elderly. Journal of the American Geriatrics Society, 41, 853-856. Marx, M.S., Cohen-Mansfield, J., & Werner, P. (1990). A profile of the aggressive nursing home resident. Behavior, Health, and Aging, 7(1), 65-73. Marx, M.S., Werner, P., & CohenMansfield, J. (1989). Agitation and touch in the nursing home. 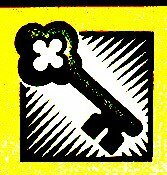 Psychological Reports, 64, 1019-1026. Meddaugh, D.I. (1986). Exercise-to-music for the abusive patient. Clinical Gerontologist, 6(2), 147-154. Rudman, D-, Alverno, L., & Mattson, D.E. (1993). A comparison of physically aggressive behavior in two VA nursing homes. Hospital and Community Psychiatry, 44(6), 571-574. Ryden, M.B., Bossenmaier, M., & McLachlan, C (1991). Aggressive behavior in cognitively impaired nursing home residents. Research in Nursing and Health, 14, 87-95. Ryden, M.B., & Feldt, K.S. (1992). Goaldirected care: Caring for aggressive nursing home residents with dementia. Journal of Gerontological Nursing, 18(W), 35-42. Weinrich, S., Egbert, C, Eleazer, G.P., & Haddock, K..S. (1995). Agitation: Measurement, management, and intervention research. Archives of Psychiatric Nursing, 9(5), 251-260. Whall, A.L., GiIUs, G.L., Yankou, D., Booth, D.E., & Beel-Bates, CA., (1992). Disruptive behavior in elderly nursing home residents: A survey of nursing staff. Journal of Gerontological Nursing, 18(10), 13-17. Winger, J., Schirm, V., & Stewart, D. (1987). Aggressive behavior in long-term care. Journal of Psychosocial Nursing, 25(4), 28-33.